Summon: Equip each friendly creature in this lane with a random item. 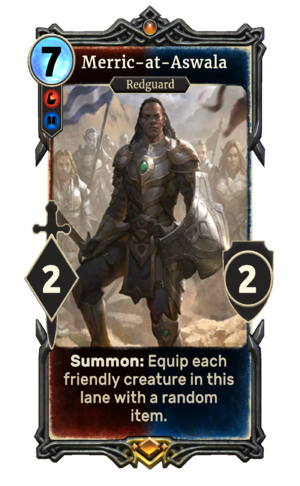 Merric-at-Aswala is a unique legendary Battlemage creature card. It is part of the Core Set. "By Stendarr's breath, we are ready for battle!" Merric-at-Aswala first appeared in ESO. This page was last modified on 16 February 2019, at 15:32.